Chelsea Elizabeth Manning, (born Bradley Edward Manning; December 17, 1987) is a United States Army soldier who was diagnosed with gender identity disorder while in the Army. After Adrian Lamo exposed Manning leaking secret government files to WikiLeaks in 2011, readers of The Guardian chose her as 2012's person of the year. On 21 August 2013 she was sentenced to 35 years in prison. However, on 17 May 2017, Manning was released early by order of President Barack Obama on 17 January 2017. 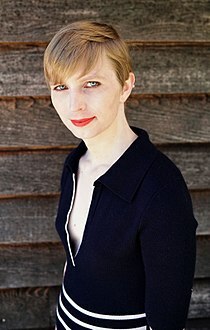 On January 11, 2018, Manning announced her plans to run for the U.S. Senate in Maryland. To challenge the state's senior senator, two-term incumbent Ben Cardin, as a Democrat in the June 26, 2018 primary election. Manning was born in Crescent, Oklahoma. ↑ 1.0 1.1 Tate, Julie. "Judge sentences Bradley Manning to 35 years", The Washington Post, 21 August 2013. ↑ Tate, Julie and Londono, Ernesto. "Bradley Manning found not guilty of aiding the enemy, convicted on other charges", The Washington Post, 30 July 2013. ↑ Londono, Ernesto; Rolfe, Rebecca; and Tate, Julie. "Verdict in Bradley Manning case", The Washington Post, 30 July 2013. ↑ Savage, Charlie. "Manning Acquitted of Aiding the Enemy", The New York Times, 30 July 2013. ↑ Pilkington, Ed. "Bradley Manning verdict: cleared of 'aiding the enemy' but guilty of other charges", The Guardian, 31 July 2013: "the soldier was found guilty in their entirety of 17 out of the 22 counts against him, and of an amended version of four others." ↑ "'I am Chelsea': Read Manning's full statement". today.com. 22 August 2013. As I transition into this next phase of my life, I want everyone to know the real me. I am Chelsea Manning. I am a female. Given the way that I feel, and have felt since childhood, I want to begin hormone therapy as soon as possible. I hope that you will support me in this transition. I also request that, starting today, you refer to me by my new name and use the feminine pronoun (except in official mail to the confinement facility). I look forward to receiving letters from supporters and having the opportunity to write back. ↑ "'I am Chelsea Manning'". MSNBC. 22 August 2013. ↑ Staff, Guardian (10 December 2012). "Guardian person of the year: Voters choose Bradley Manning" – via www.theguardian.com. ↑ "Bradley Manning Sentenced to 35 Years for Leaking Secrets". ABC News. ↑ "Chelsea Manning files for US Senate bid in Maryland". Associated Press. January 14, 2018. Manning is yet to file for the primary with the state elections board, which she must do in person by Feb. 27.